As many people know that have returned from a trip to the veterinarian with their cat with medications, cats can be notoriously difficult to medicate. This is quite obviously problematic, as the entire reason those medications came back with you is because the cat needs them to return to full health. Unfortunately, the process of medicating at home can leave both owner and cat exhausted, frustrated and one of them (place your wagers) may need stitches and a blood transfusion. Just because it might be easy to give up at this point doesn’t mean it’s in your cat’s best interests or their health’s. If the professionals can manage to do it at the vet office, almost anyone can with the right techniques. 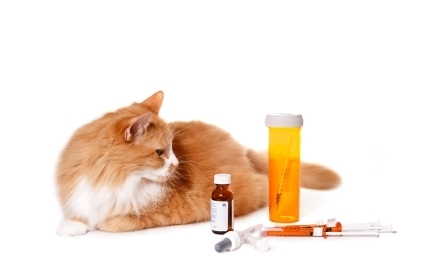 So how do we get our cats to take their medications? There are several techniques or even tricks to get a cat to swallow medication, some of which will be detailed here in brief (for questions or more information, contact your veterinarian). The type of medication will also likely dictate the best course, as what works well for pills may not work for fluids. When your cat has been prescribed medications, ensure that you talk to your vet first about how they are to be administered and ask for a demonstration on technique. So now that you’ve seen the veterinarian demonstrate, it looks pretty simple, right? It can be, if you get the technique correct and don’t stress out your cat. Having them take their pill or fluid medication orally through the use of gentle restraint and medication placement in the mouth is the most common method of treatment. Sure some cats won’t be terribly pleased about it, but others are quite happy to oblige. The following video from International Cat Care, a charity promoting the health and welfare of cats, provides a perfect step-by-step instruction if you need a technique refresher. Note: the softly, softly approach and the use of gentle restraint is vital so as to not stress out the cat. If a cat becomes stressed then the job becomes infinitely more difficult and your chances of cooperation with future doses is far less likely. If a cat just doesn’t will not take a pill for you, in spite of your best efforts and the right technique, there are products on the market and in your pantry that can make just about anything palatable to a cat. Mind, it works best if your cat doesn’t chew their food too much or the game is up! 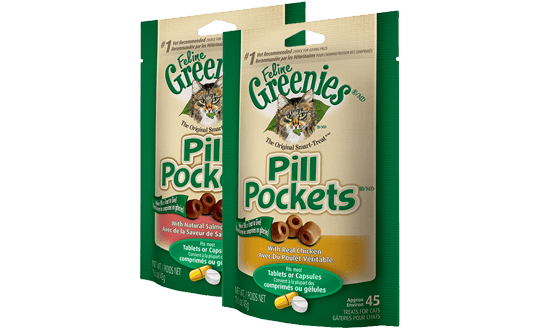 One market product that can be found in many pet stores is the hollow treat with a convenient pocket designed for pills. This seems like a delicious special treat to them and also allows many pills to slip down the hatch incognito. Alternatively, try concealment inside of a small ball of tinned cat food or even a chunk of cheese. Note: Not all medications can be taken with food. Ask your veterinarian first before medicating your cat with food. Some medications that are normally in tablet format, but certainly not all, can be compounded down by your veterinarian or their supplier and added to a flavoured liquid that many cats find delicious. This route is more expensive than the cost of regular tablet medications but it does provide a less stressful way for both pet and owner to ensure that a cat receives the necessary treatments it requires. Another liquid option would be an injectible format, which is also not always an option depending on the medication, although subcutaneous injections are often simple in comparison to other methods of treatment. Note: Always check with your veterinarian first about whether a medication can safely or effectively be taken as a liquid and do not prepare it yourself unless otherwise instructed. If your best efforts just aren’t working and you can’t medicate your cat, all hope isn’t lost, most veterinary clinics are happy to help. Many medication regimens are for a short duration, such as antibiotics, so if you’re just not able to get past your feline’s staunch resistance, bring your cat by the vet’s for its daily dose. It might not be the most convenient method of medicating a cat but ensuring that they get the care that they need to be healthy is paramount. For other questions about your pet’s medications or how to administer them, talk to your veterinarian today.